adidas has made a new Away Kit for the reigning World Cup champions. A different kit, filled with tradition and history! We have been in for a treat the last couple of days in terms of new kits. Today is no exception as adidas reveals Germany’s new Away Kit. A kit which is all about tradition and history, and for some it might look familiar. Want to learn more about the Away Kit, then read along here! Die Mannschaft is going to play in a traditional Away Kit during the 2018 World Cup in Russia. adidas has made the new German Away Kit in a greenish colour, with a hint of mint. The official name of the colour is also known as adidas’ EQT Green. The Away Kit is inspired by Germany’s history and tradition, and draws inspiration from the early 1990s and 1994. Germany won their third World Cup title back in 1990, and here they wore their well known green Away Kit during the World Cup. To celebrate the victory 28-years ago, adidas has re-launched a new shirt with a retro design. This will also be their first green away kit since the Euro 2012, and it might be one of the best adidas Away Kit this year! 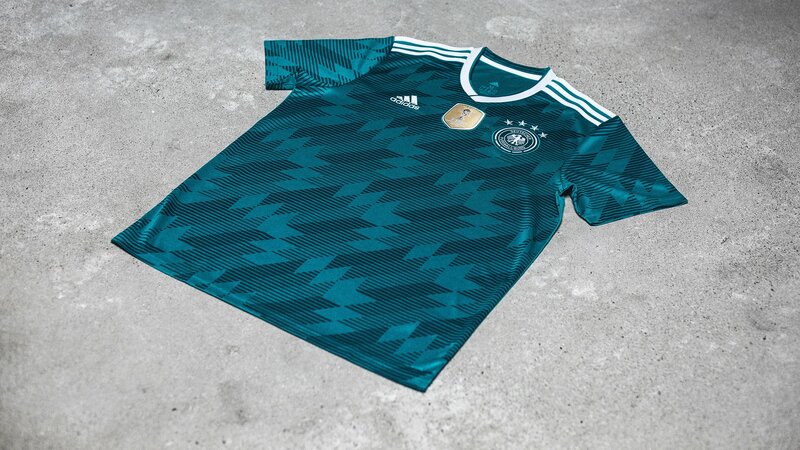 The Germany Away Kit has also a graphical pattern, as all the other adidas sponsored countries have on their Away Kit, and the inspiration to the pattern is taken from the late 1980s and early 1990s. The graphical pattern is seen on the whole front and also on the sleeves. Furthermore, adidas has also applied white details around the collar and also made the crest in white. To complete the great design, adidas has also added the iconic three stripes on the shoulder and will combine the shirt with white shorts and green socks. Lastly, the World Cup winners logo will also be featured since Germany won the latest World Cup, and they will be the only country who will have the badge on the shirt. Can’t wait to get your fingers in the new Germany Away Kit? Then buy yours right here when it gets available, and show your support to Die Mannschaft!